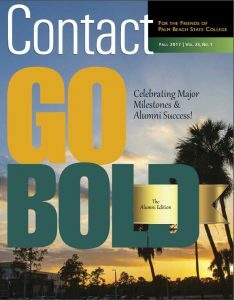 Contact is the magazine of Palm Beach State College. It is published by the Office of College Relations and Marketing and distributed to more than 60,000 alumni, faculty, staff and donors of the College. We welcome submissions of story ideas regarding our outstanding alumni, faculty and staff. To reach the Contact magazine staff, call 561-868- 3122 or send an email to crmarket@palmbeachstate.edu.